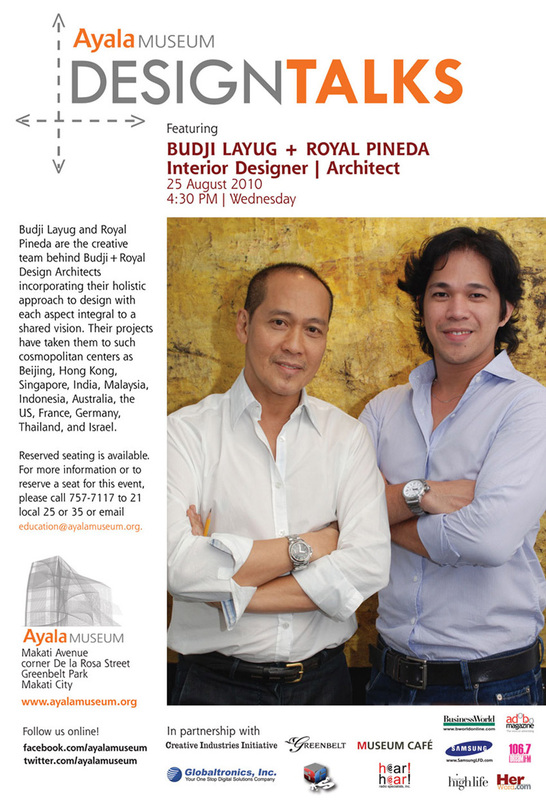 The well-known design and architecture team of Budji Layug and Royal Pineda will speak about their philosophy and practice at the next DesignTalks event at Ayala Museum on Wednesday, August 25 at 4:30 PM. Both Budji Layug and Royal Pineda are the creative team behind Budji+Royal Design Architects incorporating their holistic approach to design with each aspect integral to a shared vision. Their projects have taken them to such cosmopolitan centers as Beijing, Hong Kong, Singapore, India, Malaysia, Indonesia, Australia, the US, France, Germany, Thailand, and Israel. Reserved seating is available. For more information or to reserve a seat for this event, please call (632) 757-7117 to 21 local 29 or email education@ayalamuseum.org.